Albany, NY – July 22, 2015, Blasch Precision Ceramics, Inc., an Albany-based ceramic technology manufacturer, announces CeraLine™ – its new abrasion resistant product line including ceramic lined elbows, pipe and spool linings. Specifically designed for the harsh environments within mining, power generation and other heavy industrial processing industries, Blasch’s new CeraLine family of products exhibits exceptional wear and abrasion resistance which results in unparalleled life. 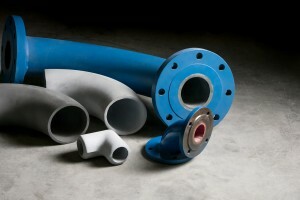 Blasch’s unique casting process facilitates the manufacture of smooth bore, one-piece abrasion resistant elbow linings. Pipe diameters ranging from ½” up to several feet can be lined with Blasch pre-cast tight tolerance shapes available with engineered joints and smooth bore that eliminates premature wear and interrupted flow. Available in a variety of premium refractory materials and complete turnkey units with steel pipe and flanges, these systems are individually engineered to suit specific applications and offer a drop-in replacement to existing piping.